Before our food allergy journey, I have a growing jewelry business which I run from home. After all four children were properly diagnosed with their allergies, I was caught in a very difficult dilemma. Not only did I have to change our diet and make it allergy friendly, I also found out that maintaining a lifestyle with allergies, eczema and asthma to consider is a full time job on it’s own. As much as I want to “have it all”, there’s no way I can keep up with all the demands of being full time food allergy mom and entrepreneur. I have to sacrifice something. Guess what I gave up? It has been 5 years since that choice. The food allergy journey isn’t over. As with any medical condition, there were so ups and downs. So many questions yet no definite answers or solutions. I have come to accept bittersweet stories whenever we go to the allergist’s office. Where do I get my strength to stay positive? 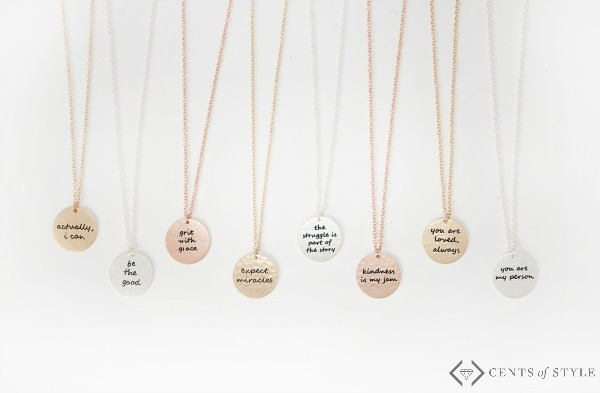 On simple unexpected things like my favorite inspirational necklaces which I wear close to my heart. Reading these phrases allows me to be hopeful when things don’t seem to go my way and confident whenever I doubt my capabilities or situation. Who knew fashion can have a deeper purpose? What helps you stay inspired? Love to hear from you.